• Suede Leather. • Color: Black Suede. • Side Zipper Closure. Brown leather Prada boots. Worn, a bit distressed but still in great condition. Small heel, very comfortable, and zipper at the back with velcro top that says "prada" imprinted in the leather. Boot hits right under the knee, runs a bit big. Circumferences: 12.5" top edge, 12" calf, 8.5" ankle. New in box with dustbags! Excellent condition. No wear to speak of. Celebrityowned cares about YOU! Prada Boots for AMAZING PRICE size 36 / 6. You would love them! Prada dark brown Suede leather pull on Knee High heels Boots size 36 / 6 . Condition is Pre-owned. Shipped from New York. I got them as a gift a year ago. Barely used them. Added a new sole as you can see in the picture. Looks in a very good condition. You will love them, this is an amazing deal since they bought for 1400$$. BEST DEAL! PRADA BOOTS FOR AMAZING PRICE Accept returns in 30 days. Croco embossed leather upper. Circumference: 13. Boots are Pre-owned, Good Condition. Material: Leather. Brown color. Pull on style. Moderate wear on the bottom soles. Light scuffs around toes & back heels. Stunning pair of Prada knee-high boots in black patent leather with side zip closure and high block heel. - Prada black logo on side black fabric stripe. - patent leather uppers. - Size 36 (EU) 6 (US) 3 (UK). Little markings on toe seen on photos. "PRADA" Stamped Leather Insole. Two tone Textured Leather upper. Size 37 -print on the shoes. 9" Circumference. 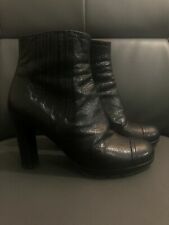 Prada Sz 6 Authentic Calf Height Black Leather Boots. Condition is Pre-owned. T he l ea th er i s go rg eo us w it h lu st er. N o sm ok in g or p et s. He el i n gr ea t co nd it io n. No b le mi sh es o r sc ar v is ib le t o t he e ye. Up for sale we have a beautiful and exclusive PRADA ladies shoes in a perfect condition. This is used item but it is practically new. Used in photo session for fashion magazine in New York City. This high style shoes will help you to create a more professional and sophisticated look. ORIGINAL BOX AND DUSTBAG INCLUDED IN THIS TRANSACTION.